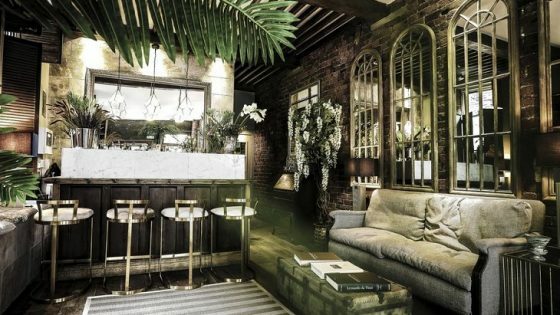 trivago data shows that London is the most popular destination for international visitors, beach locations are popular with locals, travellers from Ireland, Italy and France are searching for the longest stays, and hotel guests from USA and Australia search for the highest prices-per-night on average. These are just some of the insights from an analysis of summer travel trends in the United Kingdom, which reveals where international travellers are visiting from, and compares their search behaviour and destinations-of-choice with those of domestic travellers. 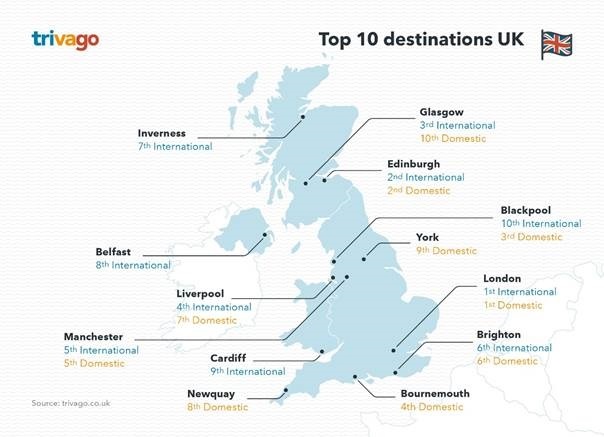 The top ten destinations in the UK account for more than 87% of searches from international travellers, to UK destinations. The most searches from off-shore countries to UK destinations are from Germany, USA, Italy, Spain, Australia, France, Ireland, Canada, the Netherlands and Sweden, are the top countries based on searches for UK hotels. The most popular destinations for domestic and inbound travellers is London, followed by Edinburgh and Glasgow. Glasgow ranks much lower for UK residents, who prefer Blackpool, Bournemouth, other seaside locations and other cities. Traveller behaviour from the key markets, for searches to destinations around the globe, show that travellers from Australia are the biggest spenders, with an average clicked price per night of £161, followed by USA with £152 and the UK with £151. Visitors from Ireland, Italy, and France are likely to stay the longest, searching for stays of eight nights on average, to destinations worldwide. 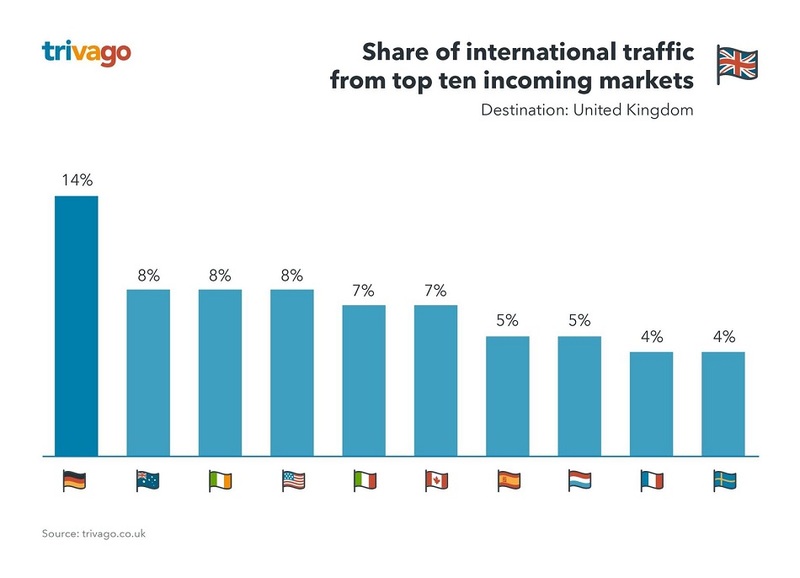 The most popular week to travel varies for each visiting country, but in terms of search volume from all markets the biggest influx of travellers is set to arrive in the UK in the week beginning 31 July. For more detailed insights into popular destinations and traveller behaviour for the UK this summer, visit the trivago Hotel Manager blog.